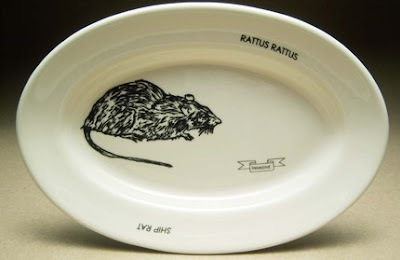 One of my favorite presents for our year of the rat wedding (L knows me well) was a set of Invasive Species Dinnerware from non fiction design collective, including Ship Rat, Gypsy Moth, Fire Ant and European Starling plates. Now I want this chandelier. OK, rats completely freak me out (a product of living in NYC, of course! ), but these are awesome! and that chandelier looks do-able. I say you get a hanging fixture from IKEA, some Christmas bulbs, and those rubber rats from the dollar store, and spray paint them white. That rat chandelier crawled out of my dreams! This is so amazing. The entire concept of invasive species dinnerware is cracking me up. Although, honestly, I'm not sure I could eat off the rat plate. And I'm not that squeamish, usually. I am not doing very well with the chandelier. It makes me want to hide. I'm sorry I'm not as cool as you. Was it mean of me not to offer a warning? I grew up with pet rats so I luuurv them. Maybe a teensy warning. Like a "WARNING: This next post has a little girl with a rat on her head, but she is not even being gobbled by that rat. In fact, rats are very nice" kind of warning.